Prayer Answered In An Hour. In putting this page together it was not my intention to produce the best page that has ever made it onto the web, a feat I achieved as you will no doubt notice. Its sole purpose is to serve as an encrouagement to anyone who maybe going through difficult period in life and to remind you that you have a God who loves you and knows what you are going through and will be with you in times of trouble and supply the grace needed to see you through, so don't give up, for nothing is impossible with Him. 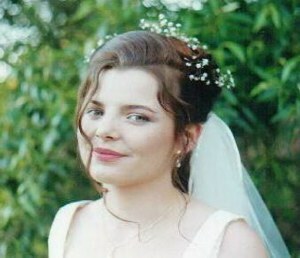 My Daughter, Leah as she looked on her Wedding Day. There was a time when Leah didn't look as beautiful as she did on her wedding day. Oh, she was always an attractive girl, but I speak of a time five years ago now when the enemy tried to steal her life. The enemy we as Christians have to face and deal with in our walk through life. But praise our God who can turn any situation around to His and our advantage when we ask. Amen. Leah was sixteen years of age at the time, an attract and well groomed young woman who had just started her first job. Life was going along quite normally, she was enjoying the work along with limited independence her small wage gave her. At home she was your normal teenager, clothes covered her bedroom floor and showed no ability in mastering the arts of bed making or dish washing, but was a loving and beautiful daughter. Overnight as it were all this changed, the household was turned upside down. Leah had left home and both my wife and myself had no idea where she was, we knew she was still in the local area but not exactly where. She had also become unreliable at her place of work loosing her job closing this avenue of contact to us. This turn of events had a devastating effect on my wife as you might imagine and I trying to remain calm was beginning to show signs of frustration, every time I would see a missing persons poster, which now seemed to be every where I looked, I would feel the anxiety and fear begin to rise. I spent days driving the streets late at night and early morning looking for her to no avail. I had been a born again believer some eighteen months at that stage and it seem that the honeymoon was over. Some months later I found her walking the streets early morning in the company of a young man known for his activities in the local drug seen. Leah's appearance stunned me more that morning than the company, her clothes were dirty, her hair unkempt, bare foot with chains around her ankles. Her attitude was cold hard and unloving and no amount of reasoning seem to have any effect on her hardened resolve. On relating the meeting to my wife who was by now on the verge of a nervous breakdown, began to go down hill noticeably, at the same time my son was experiencing emotional problems of his own. I didn't realize it then, but the enemy was having a field day with my family and I wasn't putting up any form of effective resistance. As I look back my prayers were more the cries of a defeated man than one of authority. Not long after that morning encounter I packed my wife, Barb, a few bits and pieces of camping gear into our four wheel drive on a spur of the moment decision, left our business, fortunately in reliable hands, and took off for the Top End, "Cape York". I was doing a runner also. I was to find out along the road just how ill equipped I was for the terrain we would encounter, but praise our heavenly Father we covered over 5'000 Klm's with out incident, although I must admit I held my breath on a number of occasions. The trip seemed to lift Barb's spirits particularly the river crossings, I would look across to find her inching her way up the head rest of her seat. It is an unwritten law up the Top End when crossing rivers, that you test the bottom by wadding across checking the firmness with your feet before attempting a crossing. At every crossing as I went down to survey the situation I was greeted by a sign in large red letters which read, "Warning. Esturine crocodiles inhabit these waters." So I let the tyers do the checking for me. Now I don't think that was Godly wisdom, more like sound common sense. For a number weeks we pushed our way through some of the most pristine rainforest country the north has to offer, tracking east when we could to find seemingly endless miles of white sand dune country leading down to the aqua blue of the inner reef waters of the Coral Sea. The view at Sun rise some mornings was breath taking, but the beauty of this untouched landscape could not take away the pain and concern we both held for our daughter. It was time to start heading home and see what could be done. Back on the inland road heading south we cut back to the coast to the town of Mosman. From there it was our intention to follow the coast road home, but being late afternoon we looked for a place to spend the night. At Newell Beach just north of Mosman we found a small trailer park, It was good to have a hot shower out of crocodile sight. Early next morning I walked the beach as I had become accustom to, in silent prayer wanting to know what to do next, seeking Gods wisdom in dealing with the situation. I was so taken with the beauty of the area, that the intended one night stay turned into almost three weeks or maybe I was not ready to face what I might find at home. Each morning early I walked the beach taking my walkman and one of a few of the tapes I grabbed at random before leaving home. The tape was by a preacher from Melbourne whose name I have long forgotten, but his message is still with me today. It was as if this preacher knew what we were both going through. Our God dose have a way, doesn't He. It was toward the end of our stay at Newell Beach in a phone call from our son, Matthew, that we learnt Leah was in Townsville information he had picked up on the kid's grape vine although he didn't just where. My heart sank at this news, Townsville is Queenslands largest city outside of Brisbane but it was on our road home. Passing through the outer suburbs of this city, past row after row of industrial buildings, the air field, military bases and street after street of residences heading for the city center in the distance I think I was at my lowest. Just the size of the place, I hate to admit it but I was scared stiff, I could feel that spirit of fear ripping at my heart. I thought I was pretty tough emotionally, ex Army, ex Vietnam, but here I was fighting back tears. It was then I turned to God, how human of me! I prayed a short prayer just loud enough to hear myself over the noise of the motor these exact words. "Holy Spirit, I know it is written that all things are possible with God, so in the name of Jesus put Leah across our path, even if only for just a moment". Why I unconsciously addressed this short, clumsy prayer to the Holy Spirit would later become clear. On reaching the center of Townsville, being a tourist orientated town for the Barrier reef was full of Backpacker Hostels, the obvious place to start looking, I thought! But after trying three of the Hostels and receiving the same response, "Mate, we have thousands of young girls pass through here, have you got a photo?" Which of course we didn't it was back into our car to think for a bit, or try to. Barb commented that it was hopeless, like looking for a needle in a hay stack, lets find a motel, as it was late afternoon and start afresh tomorrow. To which I replied, "let's give the Rail Station a go, maybe they might know something, ticket records or something like that." So off we drove. It makes me laugh even today, I didn't know where the Railway Station was and still don't. So off we drove again, we would have only traveled a quarter mile at best when Barb cried out. "There she is, stop, turn around, stop, its her, turn around." When I regained the use of my left arm which Barb had by almost shaken lose, I turned to look in the direction she was frantically pointing while trying to remain in control of a moving vehicle and asked, "Where?" I couldn't see a thing. "She is in that building, stop, turn around, quickly, turn around." Barb was screaming at me at this stage. The building turned out to be a TAFE. Collage dormitory building, the ground floor being a cafeteria. After making an illegal U turn I parked outside and we entered the building. Leah was there but had spotted us and had hid herself, after some pleading with the young people there we were lead to a room on the fourth or fifth floor where Leah had locked herself in the bath room. We talked for some twenty or so minuets through the door before Leah came tearfully out and three of us retired to the cafeteria and talked for what seemed like hours, the girls doing most of it. Leah agreed to come home with us the following morning but wanted to spend the last night with the young people she had been staying with. We both reluctantly agreed to this not wanting to upset the delicate situation. Dropping Leah off and noting the address Barb and I then found a motel for what was left of the night, after settling in we both got on our knees and thanked the Lord for the miracle, and it was a miracle. Lying on the motel bed that night unable to sleep, I went through the afternoon's events in my mind. From the time I prayed that prayer on the road into town to the time we found Leah, an hour had not quite passed. When we entered the cafeteria Barb was describing Leah to the young ones who worked there even down to the clothes she was wearing, it turned out that the clothes were borrowed, Barb had never seen those clothes before. As the three of us sat in the cafeteria talking things out I took note of it's interior. It covered at least 60% of the ground floor, the counter and servery were against the eastern wall which was of a solid masonry construction, stretching back from the entry which fronted the main street. The front and western sides of the cafe were full height glass walls, the western side looking onto a side street. The entire length of the glass walls from very back of the western side of the building to the entry on the main street were covered with heavy drapes, making it difficult to see out clearly and impossible to see in. The lighting which was not on when we first entered the building but came on while we were there was at best poor. From our position on the main street when Barb cried out, "there she is," it would have been physically impossible to see anyone seated in that cafeteria, let alone pick out an individual person down to the clothes they were wearing. We where at least a hundred yards away diagonally across the street in a moving vehicle looking at the corner where the side and front glass walls meat. This was more of a miracle than I had first realized. I got out of the bed as quietly as possible so as not to disturb Barb, not that I think I had to. She was out for the count, the events of the past months had taken their toll. I made myself a cup of coffee, went into the bath room and knelt thanking God again for finding our daughter. I had been given what I had asked for, "Even if only just for a moment." I did manage a few hours sleep that morning, but was up with the sun as I had to repack the Pajero the rear of which was covered with our camping gear to make room for Leah, it had been more thrown in than packed. It was while I was repacking that I noticed the rear drivers side window of our vehicle, the one Barb would was looking through when she spotted Leah, it was covered with Top End dust and road grime. I went around and sat in the front passenger seat and took a look out this window for myself. I could see that there was a car parked beside us, after all I had just been standing beside it. But the motel entry some forty or so yards away was not at all clear and the features of the houses across the road from the motel some hundred yards were quite blurred. This was in bright morning sunlight, when Barb saw Leah it was in fading late afternoon light. I was beginning to understand what had actually taken place that October afternoon. The Holy Spirit had opened Barbs eyes to see in the spirit Leah sitting in that cafe. As a born again believer on the name of Jesus there can be no other explanation acceptable. At around eight that morning we picked Leah up as planed, I was disturbed to see the degrading state of the living conditions these kids she had traveled were in, drugs was robbing them of the basics of a decant life. Before leaveing Townsville we took a drive up a hill in the center of town, Castle Hill I believe it is called. From the summit car park I left the girls and climbed to the top lookout. From this point I look out over the large and outspread suburban area of this city, I then looked back down to where I had left Leah and Barb. They both resembled ants from that height, 'well Almost'. This brought home to me the size of the haystack and the needle we where looking for, there was only one who could have found Leah in this town, the Living God our Heavenly Father and to Him be all the praise. The Greatest Miracle of All. Leah remained rebellious for almost a year after the Townsville episode and moved to Rockhampton, a city only an hours drive away for work purposes. 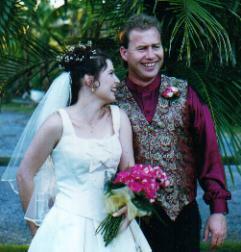 There she meat a young man, Mark Kelly, who is now her husband. It took almost all that year to lead her to Jesus, it was on one of her and Marks weekend stays with us that I looked her straight in the face and said, "I bet you haven't the courage to follow me in this prayer!" knowing her personality, she replied "want to bet." The prayer was of course the sinners prayer. The rest is history now, she was now in the Lords hands. I gave her a Bible and not long after that day Mark accepted Jesus as his Lord and Savior also. They were both married here in the gardens of our small motel by the Pastor from the local Boyne Tannum Christian Outreach Center in the September of 98. A day at one stage I thought I would never see, and one I am still paying off! Mark and Leah are now the proud parents of the best looking granddaughter a man could ever hope to have, she is just the best looker there is. "While I was with them in the world, I kept them in Your Name. Those whom you gave Me I have kept; and none of them is lost except the son of perdition, that the scripture might be fulfilled." "I do not pray for them alone, but also those who will believe in Me through their word." John 17: 12 & 20. You know, great Teachers, Preachers, Pastors may miss the mark from time to time as we all do, lose the plot so's to speak, after all we are all human. But our Heavenly Father, our Lord Jesus and our precious Holy Spirit lose no one who has ever come to the Lord. And to know that Jesus prayed for us all, we have got it made. Who better could the body of Christ have to pray for it than Jesus Himself. Amen. The Miss T. Tahlia M. Kelly. Not only did I receive my daughter back, I received a second. The Day at one stage I never thought I would see, but for the Grace and Love of God. "For we can do nothing aginst the truth, but for the truth." 11 Cor. 13:8.